When used as intended, modern wood floor finishes almost always do a good job. Be sure to read and follow the manufacturer’s instructions not only during application but, equally important, also during sanding and preparation. Many finish problems relate to working in the wrong conditions — too warm, too cold, or too humid. It’s far better to wait for the right day than it is to have to redo the finish. 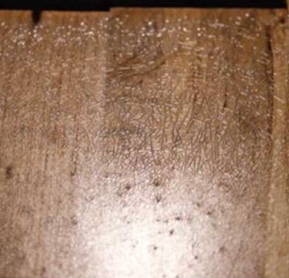 The surface of the finish doesn’t properly coalesce, which could be due to contaminants in the finish, too heavy a coat of finish, or working in conditions that are too cold. Other possible causes are recoating before the underlying finish has dried, especially when using oil-based and water-based finishes together, or adding excessive amounts of thinner. Screen the floor flat after the finish has fully cured and recoat.